Increasingly, I find that the primary value of attending industry gatherings like this past weekend's Sowbug Roundup is not the number of rods I sell. It's not seeing people's eyes light up after showing them a tying technique they hadn't seen before. It's the people I meet, and in each of the last few shows, one individual has stood out. At the Sowbug Roundup, that person was Skip Shorb. I suspect nearly everyone who fishes with furled leaders has heard of the Shorb Loop (that clever little loop incorporated into the end of the leader). Skip Shorb invented it. What interested me even more was that for several years now he has tied all his flies without a vise. He's not a tenkara angler - otherwise I'm sure he would have shown us all how it's done in last summer's TenkaraBum No Vise Challenge. We met at the tyers' party the evening before the event officially started. We spent a little time talking about making do-it-yourself bamboo rod planing forms and a lot more talking about tying flies "in hand." On the first morning of the tying demonstrations, a guy who taught fly tying sought out Skip and presented him with an interesting problem. The instructor said that one of his students had only one arm. Since Skip was already outside the box (tying without a vise) the instructor asked if he had any ideas about how a one-armed person could tie flies. I wasn't scheduled for the morning session, but I got to the venue well before the afternoon session started and sat down at Skip's table. He presented me with the same challenge. How could a person tie a fly with only one hand? We kicked around a few ideas. One of us would try something and the other would then modify it or build on it. It wasn't long at all before we had a worked out a method to tie my Overhand Worm with only one hand. It wasn't long after that before we had found a way to put a hook in a standard vise and tie a Utah Killer Bug using only one hand. We went to the Project Healing Waters table (unfortunately, I have forgotten which chapter it was) and demonstrated how to tie both flies. Hopefully, they will be able to use the methods we showed them to help a few disabled vets. One of the guys took a cell-phone video of me tying the Overhand Worm using just one hand. Perhaps it will be posted on YouTube for others to see. It's not just disabled vets who might benefit. I have a friend who lost the use of one arm when he was hit by a car. I know he fly fishes, but I never even thought to ask if he ties his own flies. I'm now sure he can - maybe not every fly in his box, but certainly enough to catch fish with flies he tied. I am pretty confident that Skip and I are not the first to think of the things we came up with (except perhaps the one-handed Overhand Worm). After all, people have been tying flies for a couple thousand years, and people have had serious arm and hand injuries for as long as there have been people. 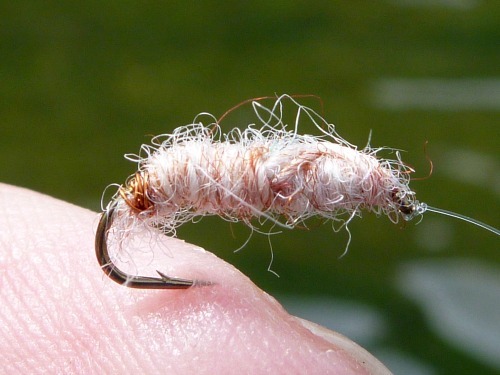 However, just as you see a new way of doing something each time you watch another fly tyer, perhaps people who thought they couldn't tie their own flies will realize they can, or people who already do tie with one hand will learn a new trick. Later that day I found out about the Evergreen Hand, which is an attachment to a vise that will hold a hook before mounting it in the vise, and will hold materials while they are being tied on. The Overhand Worm I demonstrated at the Project Healing Waters table was tied with only English hackle pliers and a pair of scissors. The Utah Killer Bug was tied with a standard HMH SX vise, English hackle pliers and a pair of scissors. I have never used an Evergreen Hand, but I am now sure that not having one does not mean you can't tie flies one handed. Lest there be any doubt, the flies work. This nice Rainbow was caught in the White River on the Utah Killer Bug I tied one handed at the Project Healing Waters table. Since I had met some of my local Project Healing Waters representatives at the International Fly Tying Symposium last November, I think I'll start volunteering at their fly tying sessions. 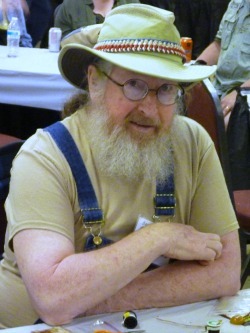 If you tie flies and enjoy working out problems, I'll present you with the same challenge Skip Shorb gave to me. Think of how a person with only one hand can tie some of the flies you tie. 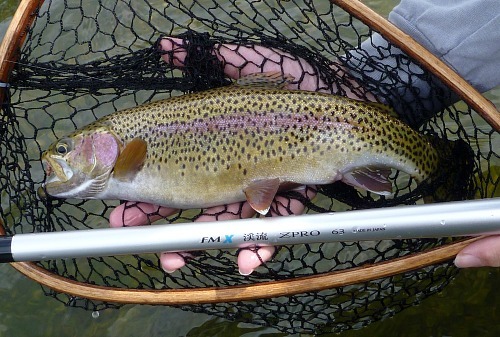 Then volunteer at your local Project Healing Waters fly tying sessions to share what you've learned.